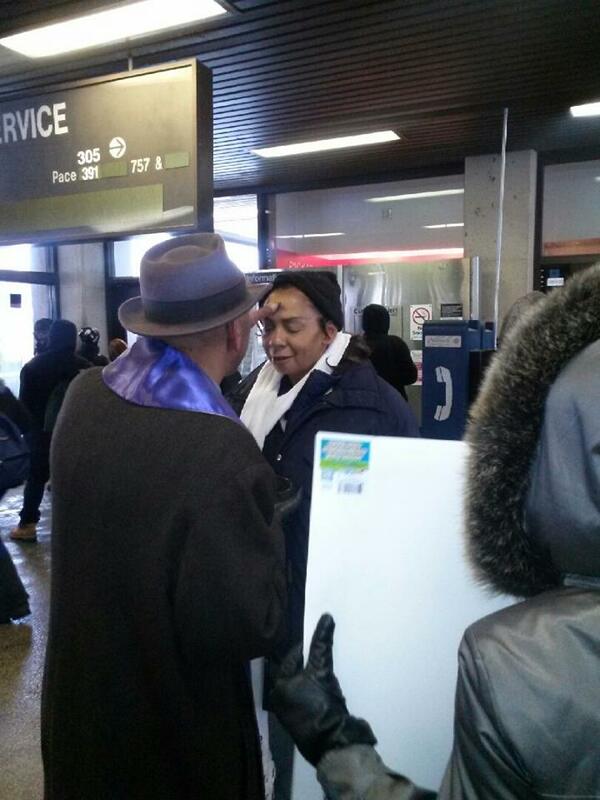 Eve was at the Harrison (NJ) Train Station and says, “Yesterday, I realized that today is Ash Wednesday. I felt disappointed that I might not be able to make it to church, I’m a single full-time working mother and between rushing the kids before school care, commuting to work and rushing back to make it before the end after school care, my weekday life is a rushing circular pattern until bedtime. When I saw Christ Church at the station this morning, I was so overwhelmed with gratitude and feeling so blessed that I teared up. All morning my thoughts have been consumed with the fact that I did not say how grateful I was for you being there today. Alex in Andover, MA, shares this news story of his experience offering ashes. 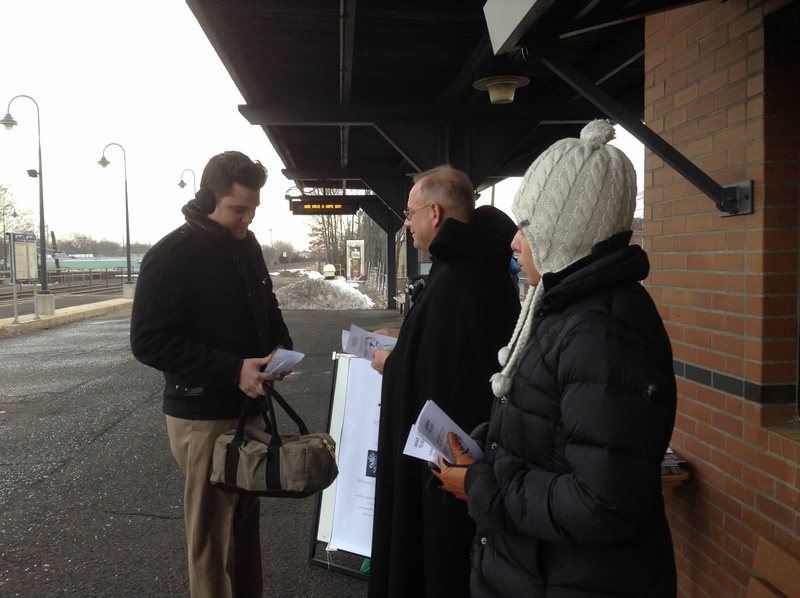 In contrast to the Arizona sunshine, Curtis Hoberman shares a photo of what happened when a light snow continued throughout the morning while the Ashes to Go team of Trinity Church, Princeton was at the Princeton Junction train station. Stories from February 18, 2015. Angel M Roque was in downtown Ft. Lauderdale, Florida and shares these images of Sharing the ashes with our Homeless comunity and Ashes to go in front of St Ambrose Episcopal Church where the parents of our children on their way to school stopped by and got their ashes. Katelyn has more good reflection about Ashes to Go and you can read it here. Many said, “I couldn’t go to church today. Thank you.” One young woman said she was on her way to therapy and would miss church. Her mother would have been upset if she didn’t get ashes. One woman said her daughter was having a blood transfusion and asked if someone could bring ashes to her. A Palmer followed her to the daughter’s room. Some asked to receive a blessing or a prayer without the ashes – including a Buddhist. “My special needs son is in the hospital – can you come to him?” Yes we will. A young man came over to the church corner looking distraught. He said he didn’t know what was happening, but he just needed prayer. His baby daughter had just died. A Palmer took him into the church to meet with a priest. Today, maybe some met God for the first time. Maybe some reconnected with a God they felt they lost a long time ago. Maybe some found a little peace and comfort during a difficult time in their lives. Maybe some wandering the Medical Center needed a reminder of their mortality and of a God who is present with them. Maybe some just needed love. On March 5, 2014, Ashes to Go could be found in 35 states and at least 3 countries. 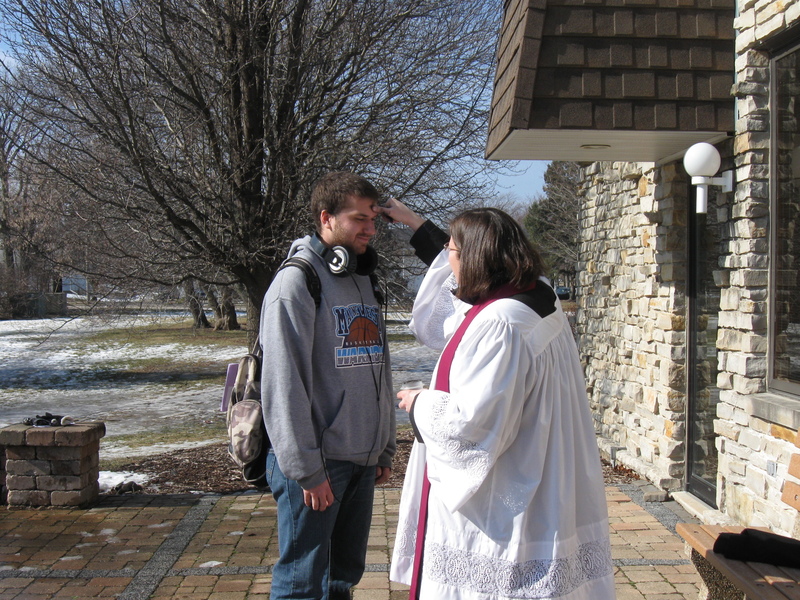 Enjoy these stories of Ash Wednesday experiences, and check out our photo gallery. 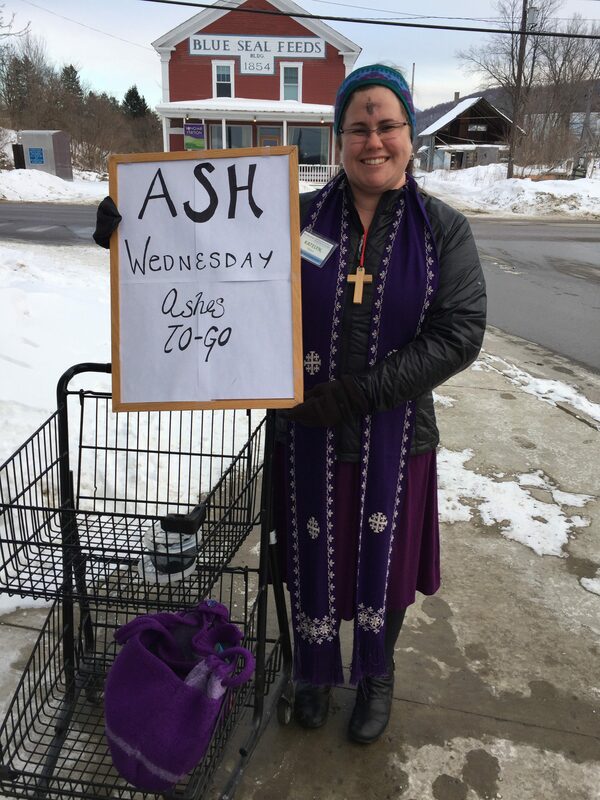 Mother Tracy Wells Miller, who offered Ashes to Go in Franklin, Tennesee, posts a thoughtful reflection on what it means to go out on the street corner with a quick Ash Wednesday liturgy. 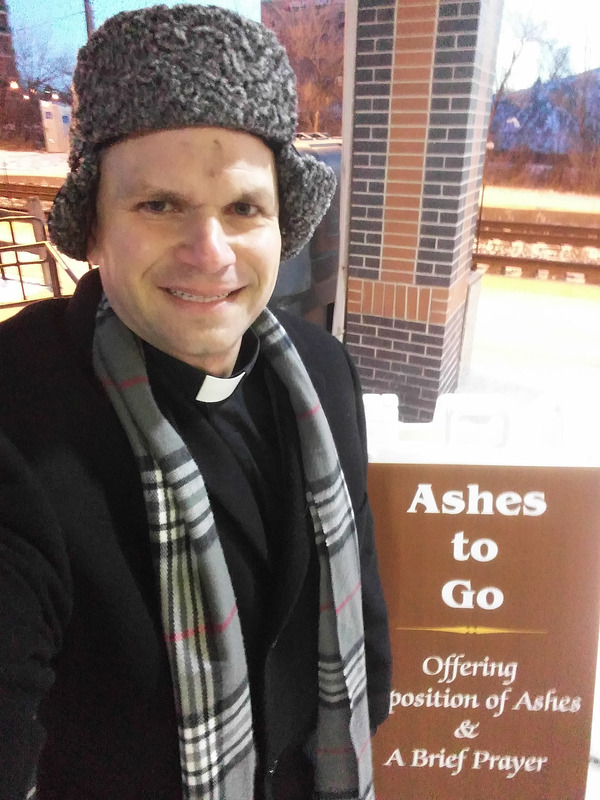 On Ash Wednesday, March 5,2014 XperienceChurch (a United Methodist New Church Start) offered “Ashes to Go,” a new approach to a centuries-old Christian tradition at …the Blue Line Station in Forest Park, Illinois. 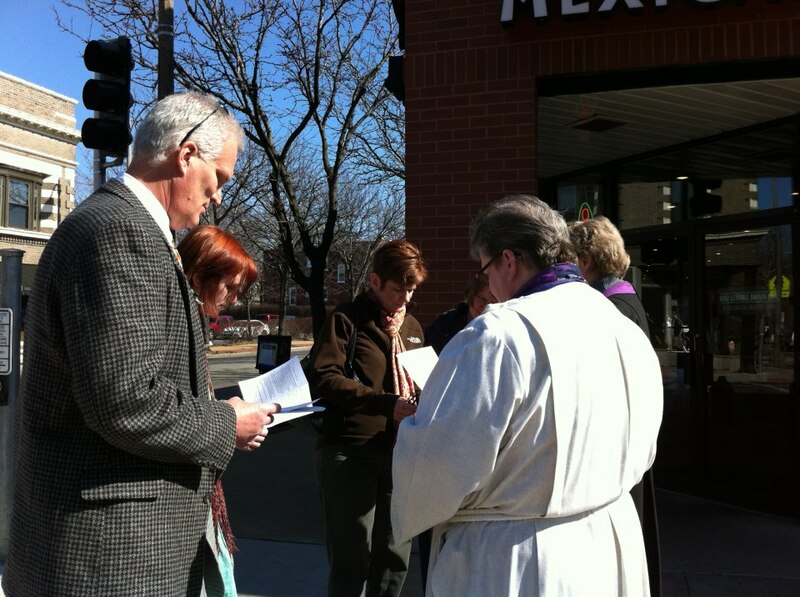 Then later that evening they had an Ash Wednesday Service @Starbucks in Super Target. They report: I must admit it was COLD, as we braved Chicago weather at 6am to 9am, but God showed Himself real as people were blessed…after they figured out what we were doing! This was our first time doing this and being a young church, both in the age of our members and the age of our church (we launched November 2013) there was anxiety but praise God we did it. Our car broke down so we were unable to go back later that afternoon but we piled up in another car and had ASH WEDNESDAY service @Starbucks that evening. We look forward to doing it bigger and better next year. Praise God. 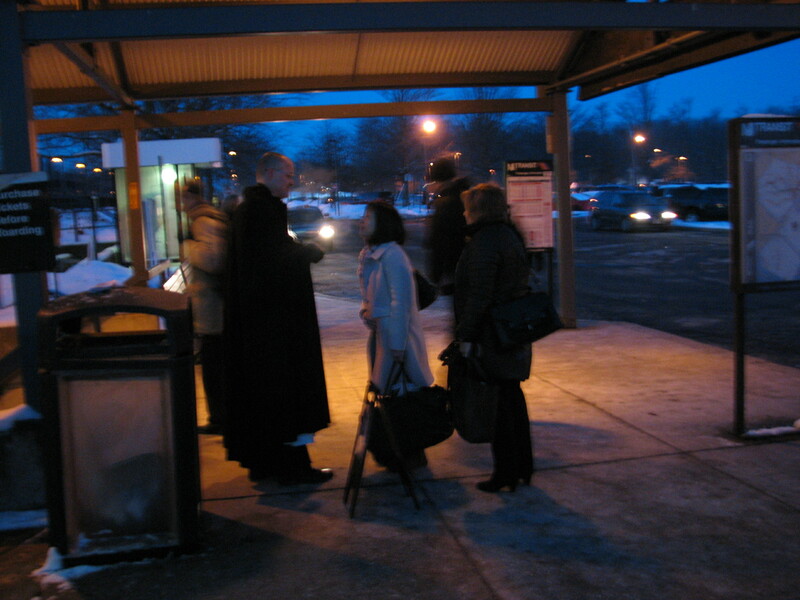 Tara Osborne was at the Geneva, IL train station, and shares the news report from the Kane County Chronicle. 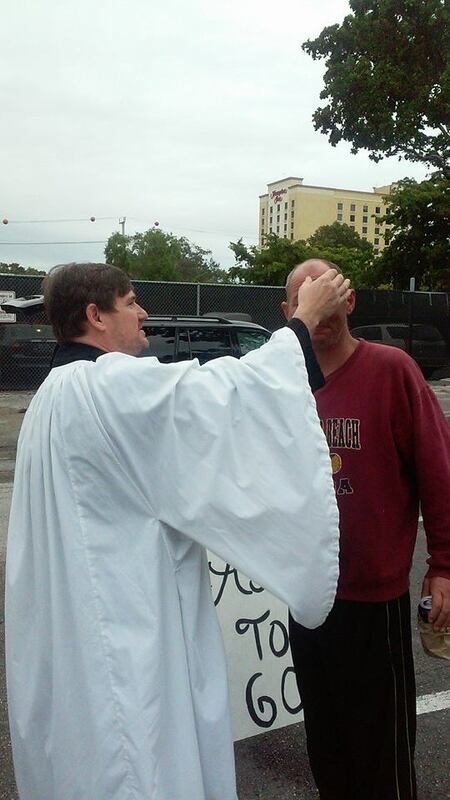 A homeless man said, “I can’t do that – I would be a bad witness to Christ.” We talked and he left with His mark on his forehead. From Dothan, AL, Michael Keeley shares this report: “It was cold and wet on Wednesday morning as drivers pulled into the entrance of Friend Bank in Dothan. There were mothers taking their children to school and a man leaving town later in the day. They weren’t at the bank to make a withdrawal or deposit. 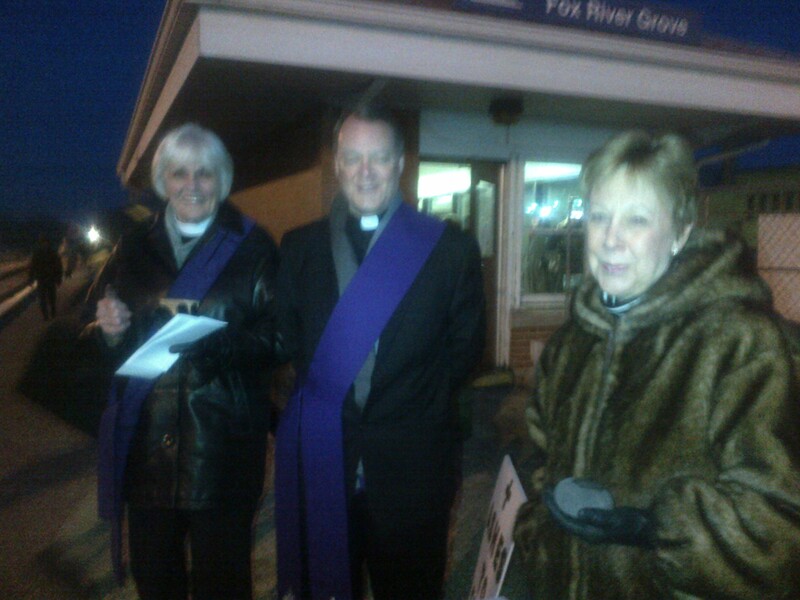 They were there to receive the Imposition of Ashes in observance of Ash Wednesday. 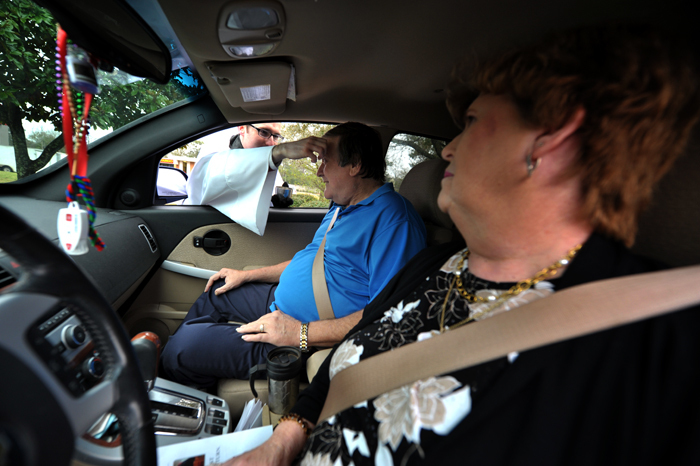 First Methodist Church Associate Pastor Wes Kelly applies ashes to Bruce Blankenship’s forehead as his wife, Dinah, looks on during a drive-thru service on Ash Wednesday. They pulled up, rolled down their windows and Dr. Jim Sanders, senior pastor at First United Methodist Church of Dothan, marked a cross on their foreheads with ashes as a reminder of their mortality and a sign of mourning and repentance. Read the whole story here. The Rev. 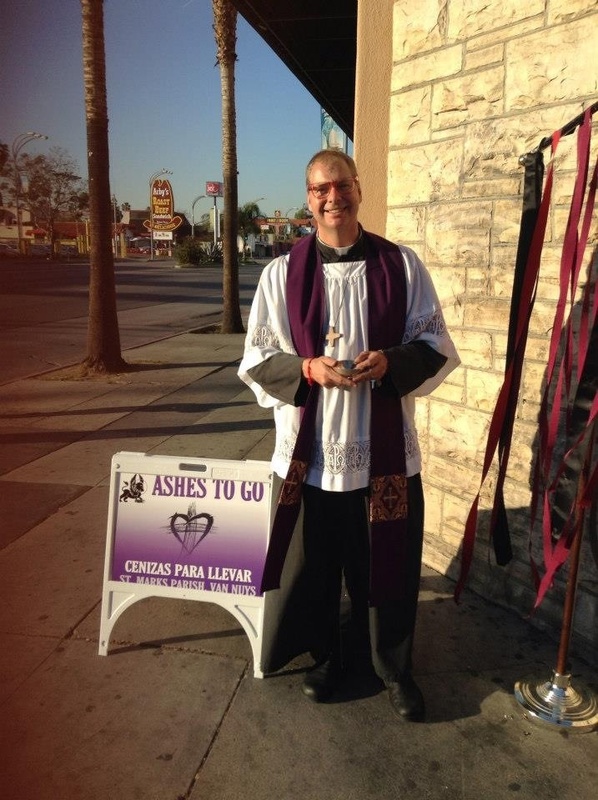 Steven P. Sabin was in the Sunset District of San Francisco, CA, and says, “Whatever theoretical and conceptual qualms I might have about Ashes to Go, the actual doing of it is a delight and the importance of the ministry comes into high relief. 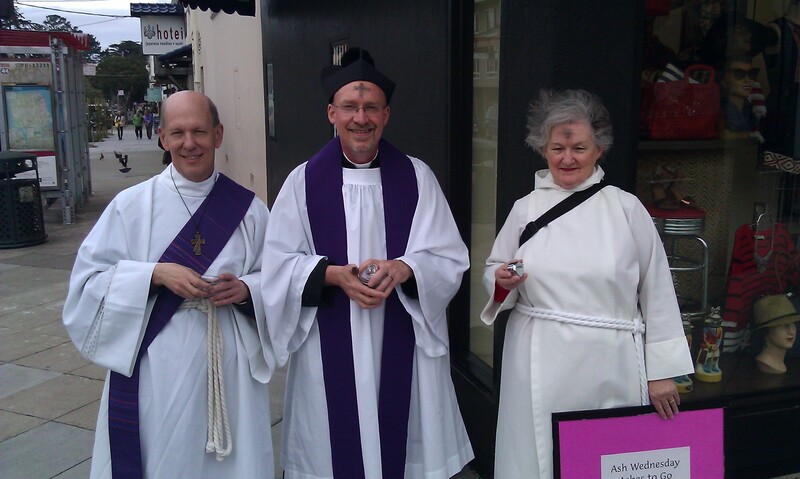 Deacon Brian Bromberger of St. John of God Catholic Church and Kitty Keller and I from Christ Church Lutheran took up our station at the corner of 9th Avenue & Irving Street in the Inner Sunset district of San Francisco at 1:30 p.m. This corner is a major stop on the N-Judah light rail line and on several bus lines. This year we imposed ashes on 152 persons. Curbside impositions were markedly up this year. Of special note in this category was an SUV with three women just leaving UCSF Medical Center after their mother (in the front passenger seat) had received chemotherapy treatment. The made a U-turn in the intersection especially to pull up to the curb next to us. The two daughters tearfully expressed how much it meant to them to receive the ashes and the prayer and blessing for their mother that Deacon Bromberger offered as their mother was far too frail following chemo to make it to church. 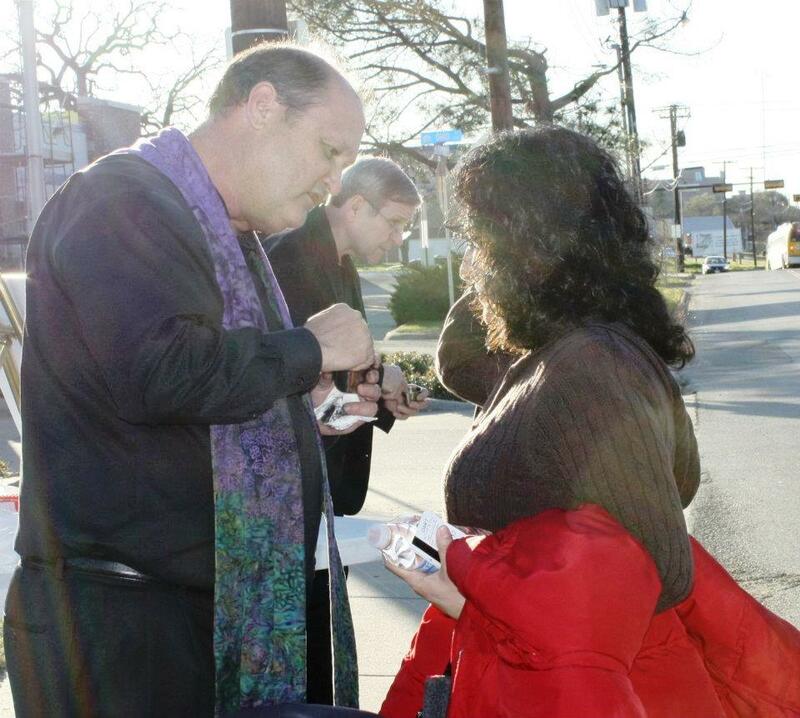 We also were able to offer ashes and prayer to a mother and her young daughter. The youngster was also undergoing treatment at UCSF for leukemia. In Deacon Bromberger’s words, “The Church has come to you.” In just this way, Christ brings the Kingdom of God to us, not waiting until we drag ourselves to the Kingdom. As happened last year, there were some people who would walk by, then walk by again, and again, until finally they would either ask for ashes or ask about what the ashes meant. Our pamphlet was handy to elaborate on the explanations we offered. The Rev. 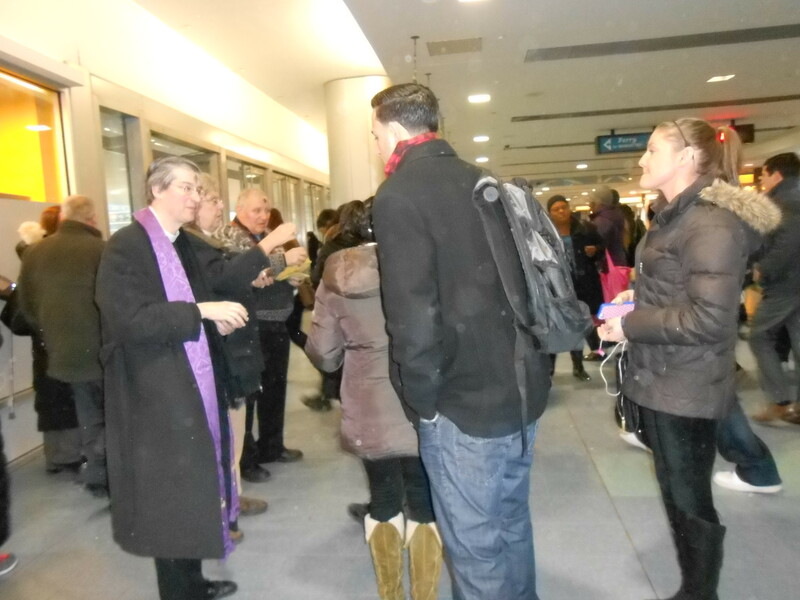 Geraldine Swanson, deacon, was at the Staten Island Ferry Terminal this morning (March 5) and reports “Over 330 ( 332 to be exact) busy New York City commuters, local workers and terminal homeless received ashes this morning as a reminder that Lent is started and that we all are “…dust in the wind”. Laura Bunch of First Lutheran Church, Tulsa, OK was at Tulsa University, and tells us: This was our first year to try this, so a group of us headed to the TU campus. After a lot of “no’s” we started to get some really nice responses. People were glad that we were there. Some foreign students didn’t know what this was about, so we were able to talk to them a bit. Busy college students said they were glad that we came since they didn’t have time to go to church that night. We even did a drive-by Ashes!! The man pulled up and rolled down his window. A reflection on Ashes to Go and the Grateful Dead from St. Philip’s in the Hills, Tucson, AZ. Coverage in the Philadelphia Inquirer suggests that Laura was one of 621 people to receive ashes at this one location! From what I believe is the original “Ashes to Go” location in St. Louis, MO, glimpses of street ministry. 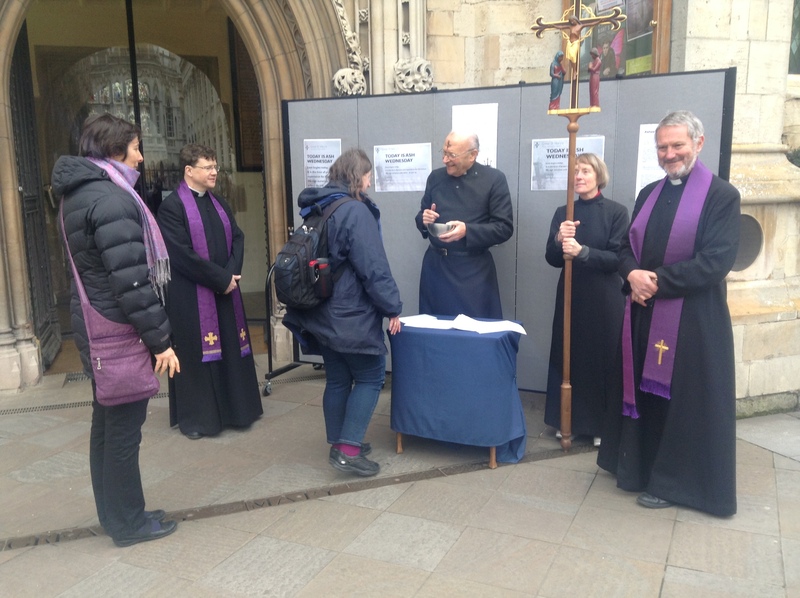 The joy as the pastors pose waiting for passers-by underlines the good news of getting church out into the world. Fr. 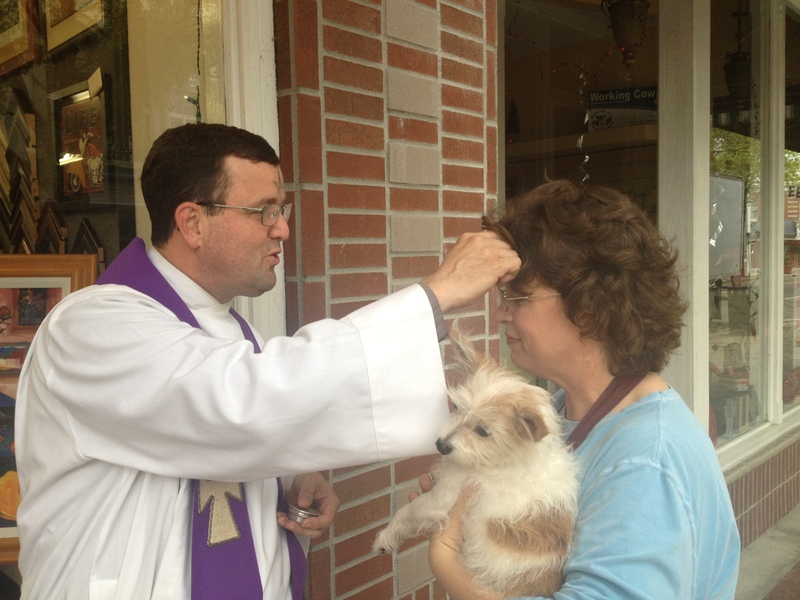 Robert Moses of St David’s Episcopal Church distributes ashes in Downtown Lakeland, FL, and found himself “front and center in the Lakeland Ledger,” according to Nancy Moses. 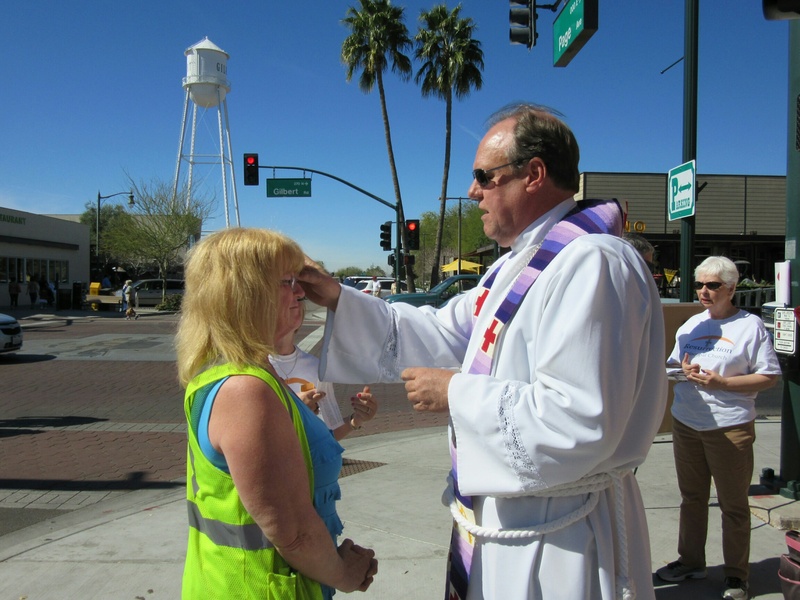 Episcopal churches in Arizona made the TV news. And here’s a great gallery of images from Washington, DC. From DeKalb, IL, Stacy Walker-Frontjes reports: “St. Paul’s Episcopal Church in DeKalb partnered with Grace Place Campus Ministry at NIU for the third year in a row to offer “Ashes on the Go.” Between the two locations we talked to 200+ students walking to and from class and many accepted our offer of ashes on the go, and several others accepted our offer for prayers for exams and other stresses of student life. There were lots of smiles, opportunities to share the basics of Lent and Christianity, and many chances to offer a good word about the love of God for all. We also had some drive up customers to our station in the St. Paul’s parking lot, including some repeats from last year who read about our taking worship to the streets in the local paper.” Their efforts were covered agan in the local paper, and on the campus news channel. 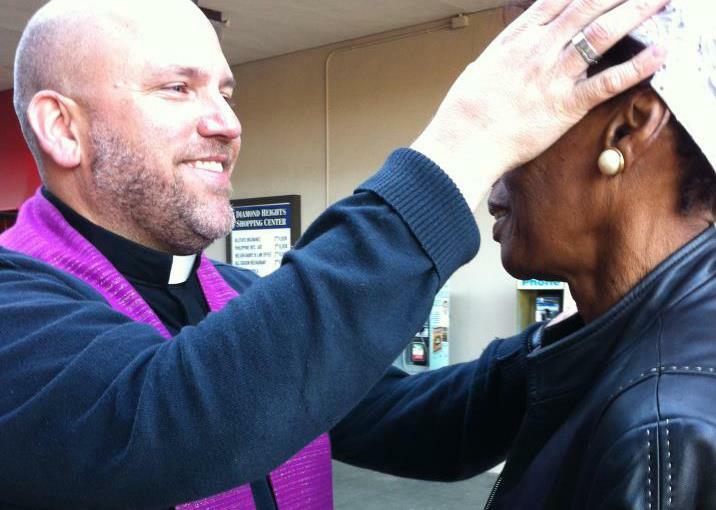 Sarah Lawton reports on a busy day in the Mission District of San Francisco: Episcopal Church of St. John the Evangelist and La Iglesia Episcopal El Buen Samaritano — Ash Wednesday 2013 — 16th & Mission BART Station, San Francisco (Mission District). We’ve been doing it for a number of years. Not sure how many, maybe six? 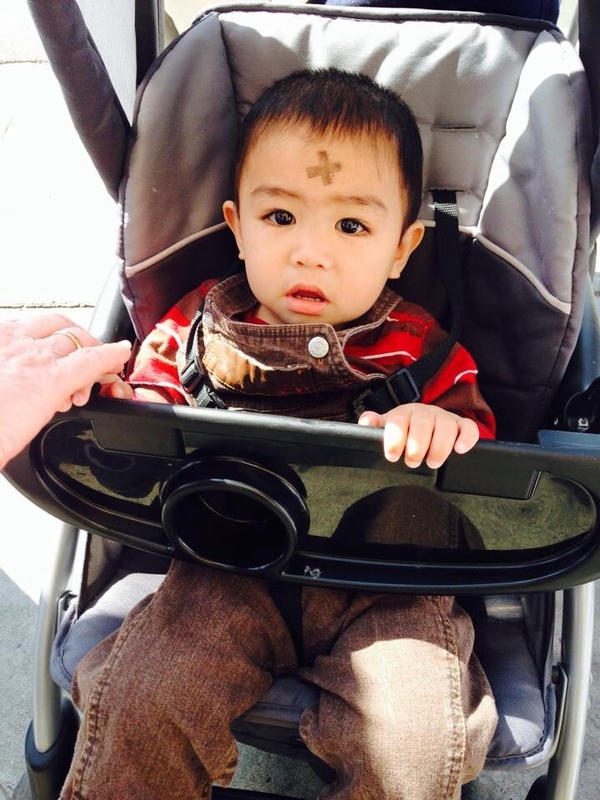 There were also ashes offered by St. Gregory’s and Holy Innocents’ Episcopal Churches at 24th & Mission BART. Earlier in the day, we held an ecumenical witness at 24th & Mission for immigration reform–and some later met with Senator Dianne Feinstein’s staff on the same issue. Blessed Lent! In the Sunset District of San Francisco, Rev. Steven Sabin was offering ashes and tells us: All things considered, the “Ashes to Go” experiment was a success. 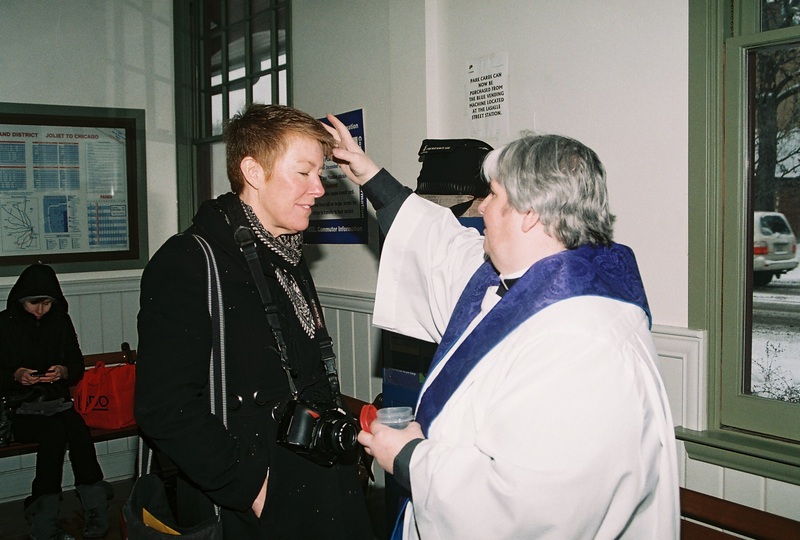 We talked with a great many people, marked the cross on the foreheads of 70 or so, had our photos taken numerous times, and reminded a very large number of people about Ash Wednesday who would otherwise not have thought of it. It was mildly angst inducing to be standing on a street corner on Ash Wednesday, the Gospel reading fresh in my ears, but there were no trumpets sounded so I suppose that makes things OK. Indeed, it was it’s own reward, because it was a great deal more fun that I had anticipated. 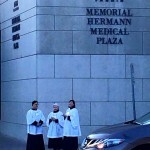 My favorite part perhaps, was boarding the MUNI bus for the trip back to church and the bus driver asking me for ashes. Here’s a link to the handout we had for people to take away with them. Margaret Pritchard Houston was outside Notting Hill Gate Tube Station in London, UK,and tells us: It was a freezing cold day, and we walked down to the Tube Station with a chalice full of ashes, setting up our sign between two cafes. 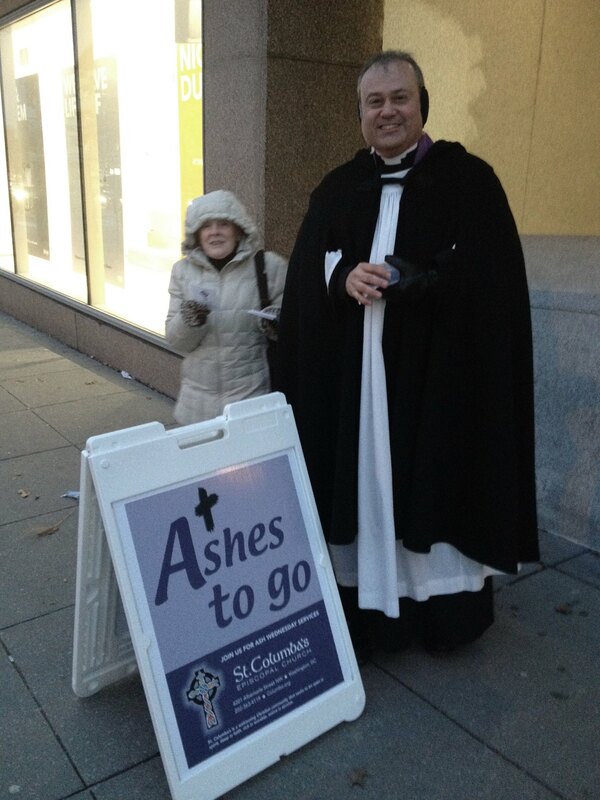 Over the next hour, we gave ashes to about 20 people – one was a member of our congregation who works long hours in the Financial District and wouldn’t make it to a service. On e was the curate of a nearby church, who wanted a brief worship experience as a worshipper rather than a leader. One was a woman who walked past us, paused at the top of the stairs to the Tube, then ran back and said, “I won’t have time to get to Mass today.” One was this woman, and I laid my hand on her dog as I told them both to go in peace. We were in a very visible spot, and people looked at us from the windows of buses, from bicycles passing by, from inside the cafes. Many people glanced and looked away, but I heard the words “Ash Wednesday” in their conversation as they passed. Kids on their way to school asked their parents what we were doing. We started thinking about how this can be done at other times of year, and there are tentative plans to have a “Tree of Life” by the station on Good Friday – a wooden cross, with paper flowers, on which passers-by can write their prayers or hopes and pin them to the cross. From Maineville, OH, Anne Warrington Wilson reports: My Methodist collegue and I decided to offer ashes across the street from the church building we share. We got permission from the landlord of the strip center. Then we packed up a processional cross and a white board for our invitation to receive ashes and for prayer requests and our ashes and set up by the entrance. This is the first time we (or anyone else) have done this. We greeted many people and a number read our sign. 4 people asked to receive ashes but many more accepted our invitation to ask for prayers for family and friends. We took the white board with prayer requests back to our church service and added them to the prayers of the people. 2 people who missed us at the Y came to the church to ask for ashes before they had to leave for an evening appointment. We’ll do this again next year. “It was very moving to offer Ashes to Go in Richmond, VA” says Laura Inscoe of Historic St John’s Church. “One fellow was walking his dog and didn’t stop for ashes. He came back 30 min. later and wanted prayers and ashes, saying, “It’s been a long time…” Only God knows what seeds were planted. An Episcopalian couldn’t get to her church today, because she was volunteering with some children at a Church Hill School. It meant a lot to her to stop and have a time of prayer. Pastor Charlene Barnes was at Point of Rocks, MD, at the train station, and says: I went with ashes and armed with a sign that said “Get Your Ash Here!” and was able to serve ten people with ashes. I was able to have conversations with many other people. 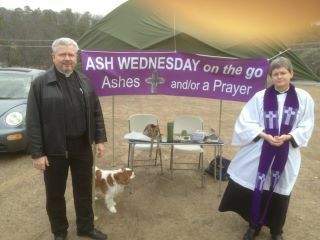 One man said, “I do not want the ashes but what is Ash Weds?” we were able to have a great conversation about it! Another lady wanted prayer because her house was forclosing and I was able to give her information to get her in touch with people that can help her out. This was such a blessing to me! But I got there at 4:45am and stayed until 7:15am – and it was freezing cold…However I would do it all again in a second! From Sam Fletcher in the Episcopal Diocese of Spokane comes this documentary story of Ashes to Go in downtown Spokane, WA. From L St and 12th, somewhere in America, Darlene Bentley reports: I work downtown. Profession: (Plant Tech) watering live plants in offices. I was so excited to see Ashes to go on the corner and I jumped in line for my Ashes. It is a wonderful concept to bring out from the church doors to the people.Keep up the good work. God bless. Sudie Blanchard tells the story of her Ash Wednesday at York Hospital in York, ME: “This is a small community hospital with 55 beds. I am the first part-time paid chaplain they have had. In preparation for the day, I created a hand out using some of the material on this site. I encouraged people to find a church community to observe Lent with, and listed local churches from a variety of different denominations on the other side of the page. I scheduled two times during the day when I would be available to impose ashes. 13 people came between 1 and 2 p.m., and three more came between 9 and 10 p.m. Most came because service times at their churches didn’t fit their hospital schedule. I had a chance for some brief one-on-one conversations – one person spoke about grief she was experiencing over a death, another about a complex family situation she was dealing with. Still another person wanted to deepen her faith. Two of our physicians came to get ashes—one in the afternoon, the other in the evening. One staff member who knew I was an Episcopalian asked with a smile if Episcopal ashes worked the same as Catholic ashes. I was able to tell this person that the ashes I was using were “ecumenical”—though they had been blessed at an Episcopal service, I had burned both Roman Catholic and Episcopal palms to make them! That was good enough for him. He received the ashes. In addition to the scheduled times, there were two other encounters. First thing in the morning, I had gotten in a conversation about the ashes with the van driver who brought me to the hospital. “Is there any reason why you can’t give them to me right here?” he asked. “None at all.” I said. So he pulled the van over, I said a prayer, and marked his forehead. It was an Acts 8:36 moment! Later, as I was walking to the van for the trip back to my car, a staff member approached me and said how sorry she was to miss the hour I was offering ashes. She’d been in a meeting. 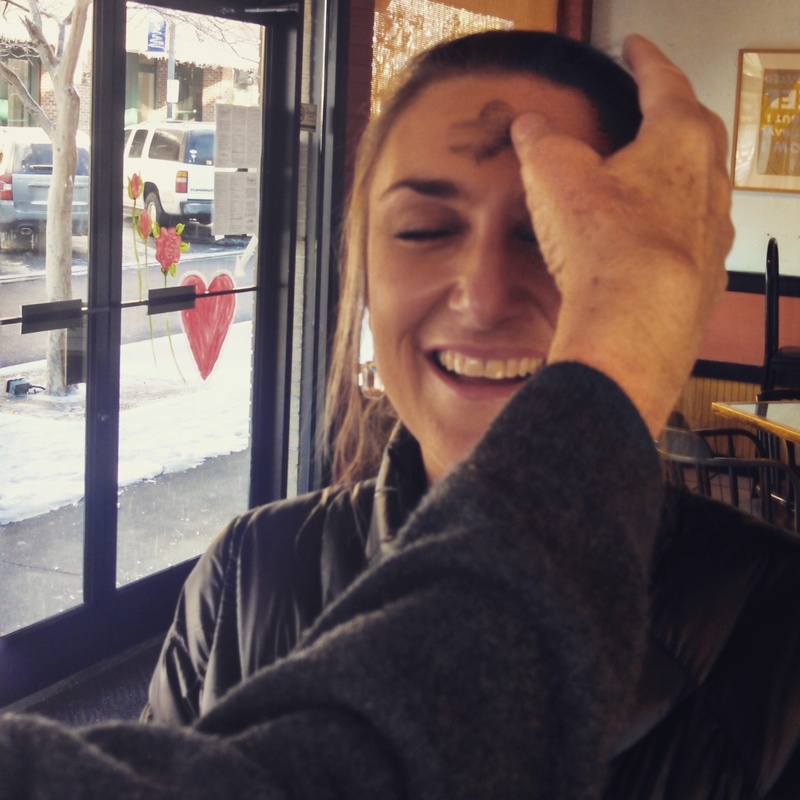 I had the ashes in my pocket, so we stopped right there on the sidewalk, prayed together and I marked her with the ashy cross. She was moved by the experience—and how the timing worked out. I remember her saying: “I really needed that this year. God’s timing is pretty amazing–He meets us just where we are.” I couldn’t agree more. In Alexandria, VA, the Rev. Heather VanDeventer was at the King Street Metro Station. 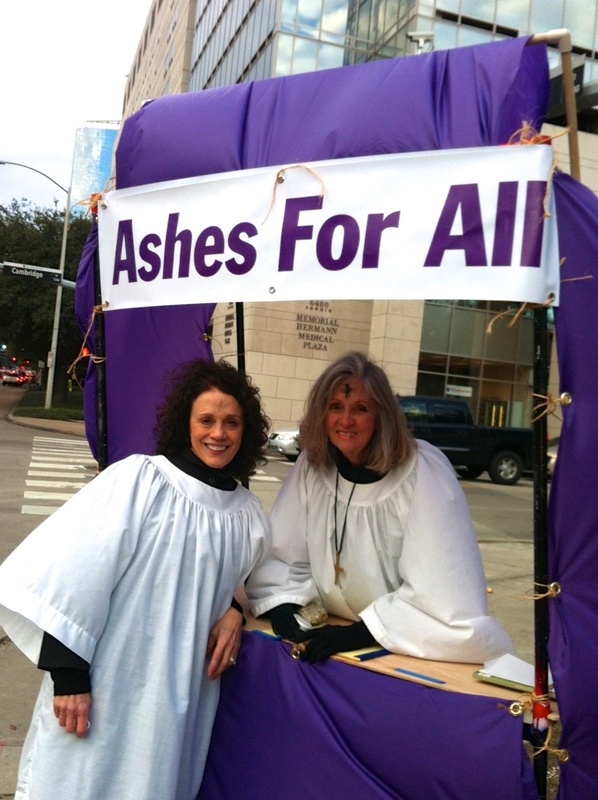 She says: My first interest in Ashes to Go was because I knew the priest, the Rev. Emily Mellott, who was developing the program. She was from the Diocese of Chicago and was a student at Church Divinity School of the Pacific when David was on faculty there. I figured that if Emily was doing it, it was worth a second look. Then while we were attending St. George’s in Arlington, before I came on staff here at Christ Church, I suggested it to the rector there. St. George’s is one very short block away from the Virginia stop on the Orange line. 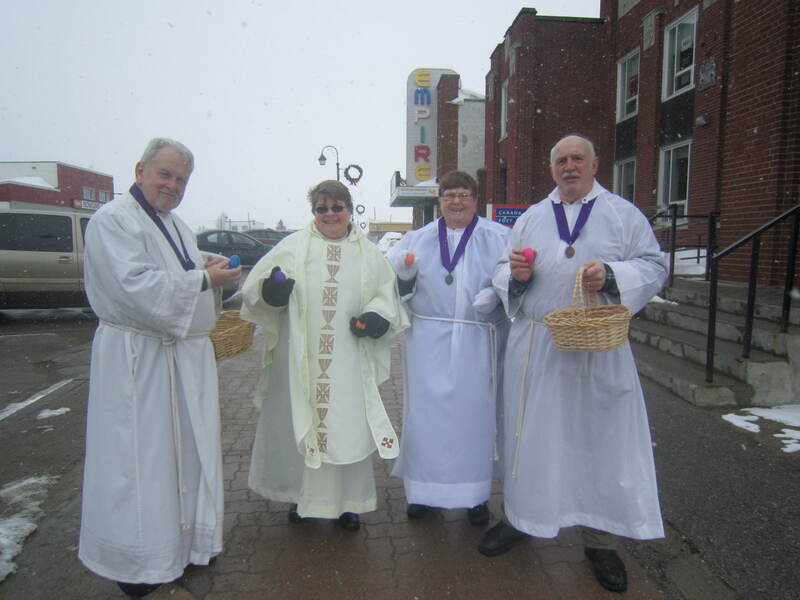 They did not do it that year, but in 2012 St. George’s had a team at their metro stop. Their experience was great and some who encountered the Ashes to Go team at the metro joined them for the full Ash Wednesday worship experience that evening. Based on their experience and our interest at Christ Church to be more visible out in the community (beyond our fence banners! ), it seemed that 2013 was the year for us to offer Ashes to Go. Our Ashes to Go team was our two seminarians, John Hogg and Fares Naoum, another seminary student, Connor Gwin, and me. We believed it was a sign from God that there was a long term parking space available for us in the King Street Metro parking lot that morning! We got there about 6:30 a.m., got some coffee, and then did our set-up outside the Metro gates. No sooner did we put down the bag with our flyers and ashes that we had a young guy there wanting ashes. It was 6:45 a.m.
By the time we left at 9:30 a.m., we had approximately 100 people come to us. Some just wanted a prayer and no ashes. Some may have just wanted ashes but got a prayer as well. There were men and women who were moved to tears and needed a hug. One young man said, “That’s for you, Dad,” after receiving his ashes, which moved our team to tears. One woman was so grateful that we were there, saying that she had been on her way to Ash Wednesday services at her church when she had a flat tire, missed the service while it was being changed, and then was able to still have ashes because we were at the Metro. 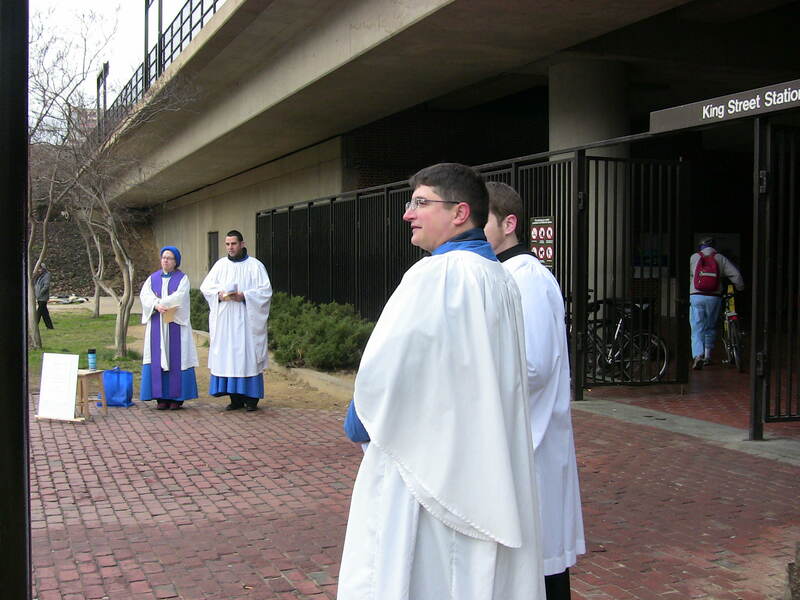 One person saw us from his hotel window came down, said he attends Epiphany Episcopal Church in Walpole, MA, and was glad that he could have a bit of Ash Wednesday worship. One of the last sets of people I imposed ashes on was a family who may have been leaving on vacation or returning home from one – mom, dad, and two teenage daughters, all with suitcases. Dad took a picture of us while we prayed and then received his ashes as well. Can you imagine that in the family album?! 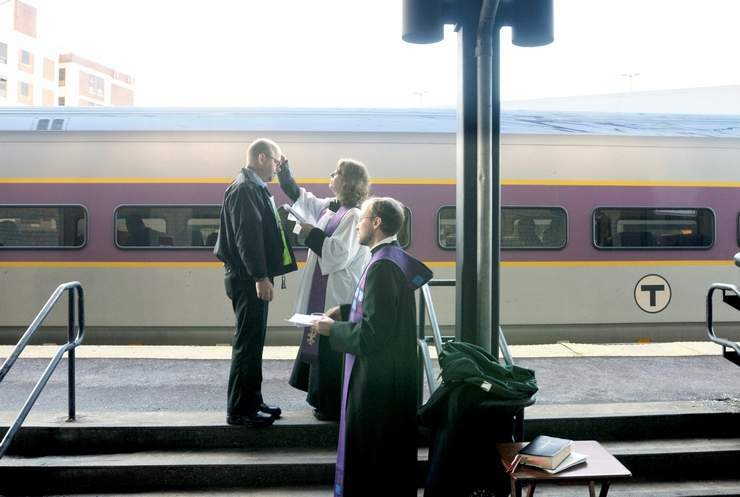 A handful of Christ Church parishioners came for their Ash Wednesday experience at the Metro – some before getting on the train, others who parked for a few minutes and then headed on their way. But the majority of the “congregation” were not affiliated with Christ Church. I expect that some were Roman Catholics, some probably other traditions, and some maybe lapsed in their faith. For me, the purpose of doing Ashes to Go was to make a space for intentional connection with God and to help the spark of faith grow again in those for whom it has grown dim. I think we accomplished those things. I look forward to doing it again next year and for listening for what other creative places, beyond our walls, God wants us to go. 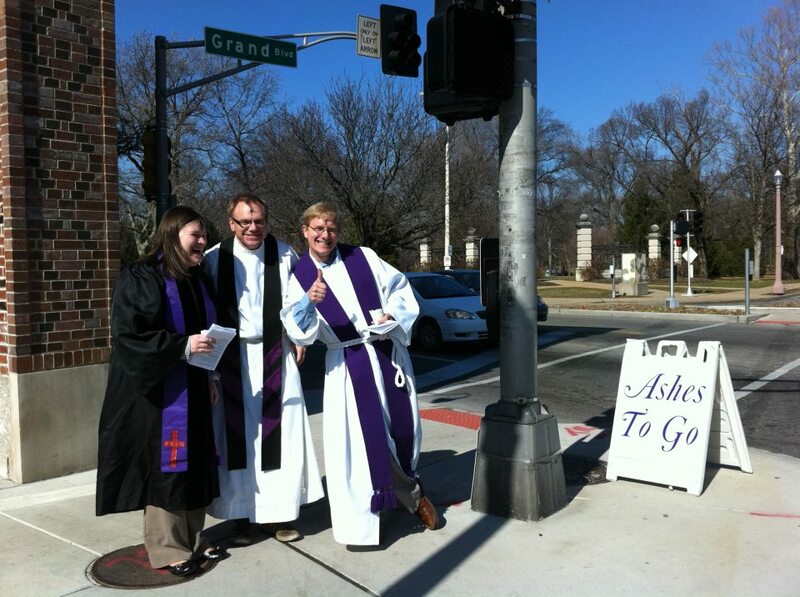 From Shawn Schreiner in Oak Park, IL, a video of the Ashes to Go experience. Warren Hicks was with colleagues the Rev. Nancy Strong and the Rev. Dr. Will Bergmann at Union Station in Worcester, MA last February. 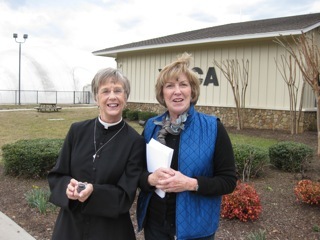 From Powhatan, VA, Becki Dean writes: The Household of St. Luke’s Episcopal Church, Powhatan, VA took ashes to the YMCA early this morning and again later in the afternoon. In between, we also took ashes to assisted living and memory care residents and to two restaurants who invited us to come. 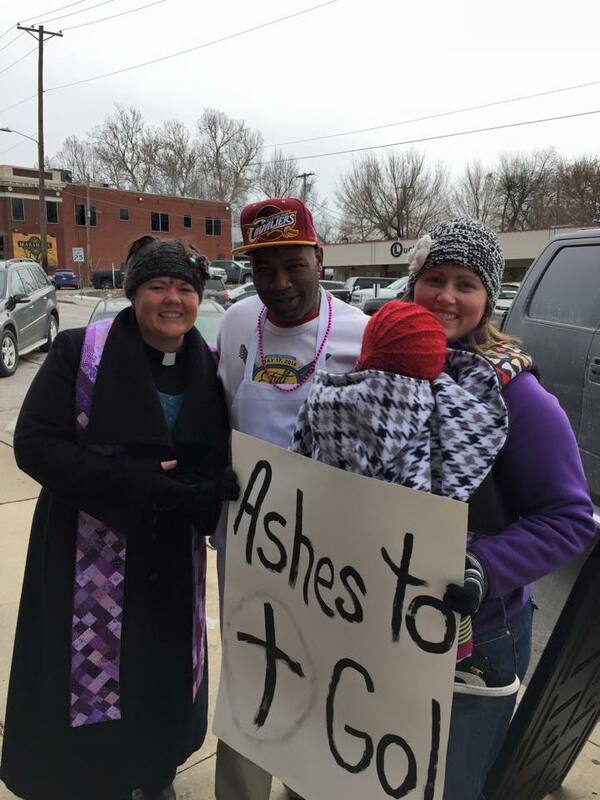 It was the first time any of us had participated in Ashes to Go and it was a very Holy experience for all of us. Nothing we could have imagined; but then God always does imagine so much more for us than we can ever imagine for ourselves. From Erie, PA, a blog post from Cathedral Dean John Downey. The Rev. 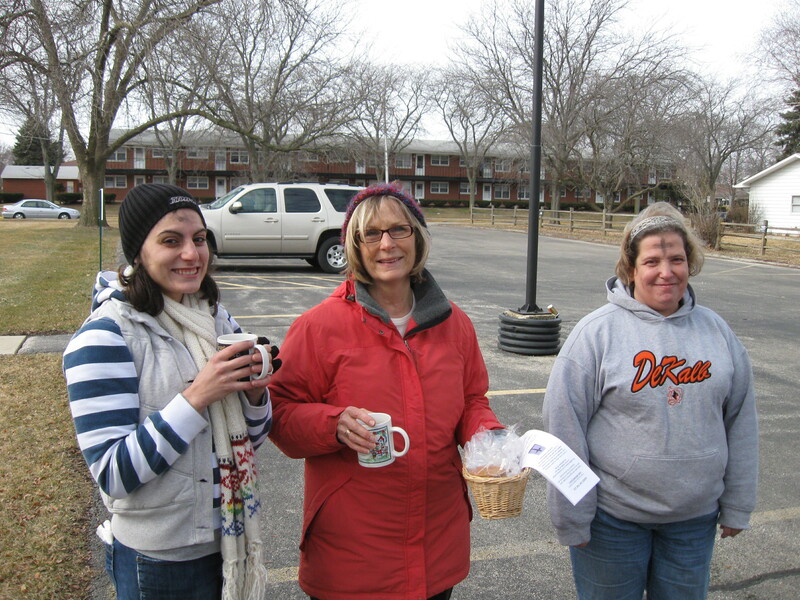 Gina Volpe reports that the Church of the Holy Family of Park Forest, IL did Ashes to Go for the first time in 2012. There were three of us: myself, Lisa Meredith, and Senior Warden Charles Clayton. Prior to going to the Metra Station, our guests from our PADS program asked if we could provide them with ashes. So we have ashes to 10 PADS guests and while at Richton Park Metra we provided ashes for 71 more. Folks were quite moved and thanked us for reaching out beyond the doors of the church into the community. From Waukegan, IL, John Anderson shares the experience of several churches via a local news article. From Brunswick, MD: The Rev. 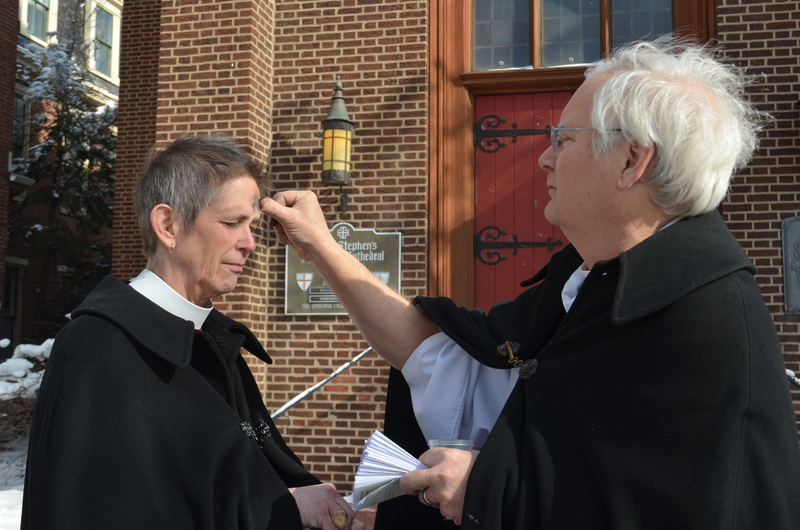 Anjel Scarborough, Priest-in-Charge at Grace Episcopal (Brunswick, MD) and the Rev. Anne Weatherholt, Rector of St. Mark’s Episcopal (Boonsboro, MD) met the first three MARC commuter trains coming into the Brunswick station. Our local NBC affiliate did a story on the late news about Ashes to Go. It was a time where the presence of Christ was visible and touched the lives of people who could not have received ashes in a traditional way. From Conifer, CO, Nina Churchman writes: Yesterday, at the 12:00 noon service I mentioned that I had just heard about the Ashes To Go idea that morning and what a great idea it was. Two parishioners, one very new to the church, called my bluff and said that we should do it and they would go with me. I called the manager of the local King Soopers and he said we could stand outside the entrance. It was a VERY windy day so we stood more inside than out and had a large sign saying “Ash Wednesday ASHES, brought to you by St. Laurence Episcopal Church.” We stood there for about an hour and 15 minutes and gave ashes to 19 people. Some people avoided our eyes, many hurried by, some looked completely confused but the ones who wanted the ashes seemed very grateful. It was a great experience. 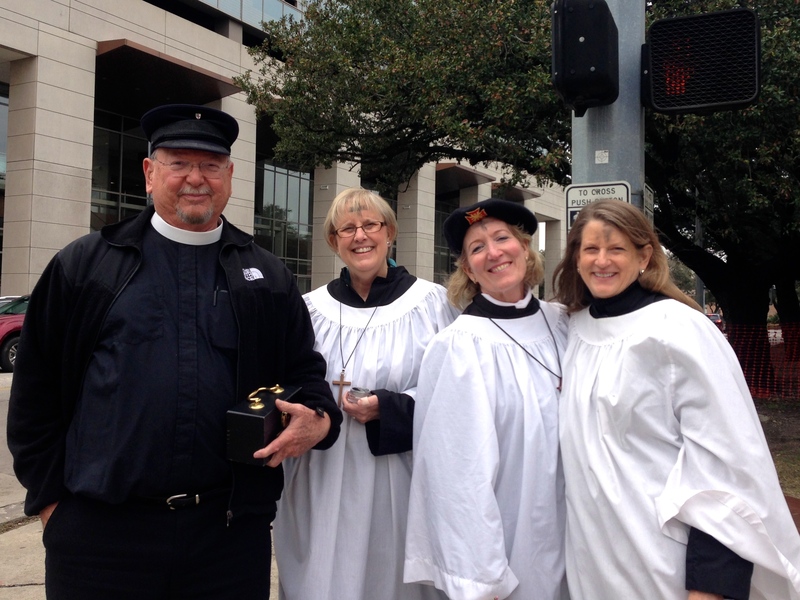 From Irving, TX, Russell Floyd tells the story of ministry at the South Irving DART station with members of First Methodist, Irving. From Wauwatosa, WI, near Milwaukee, Anne Bingham writes about unexpectedly receiving ashes. 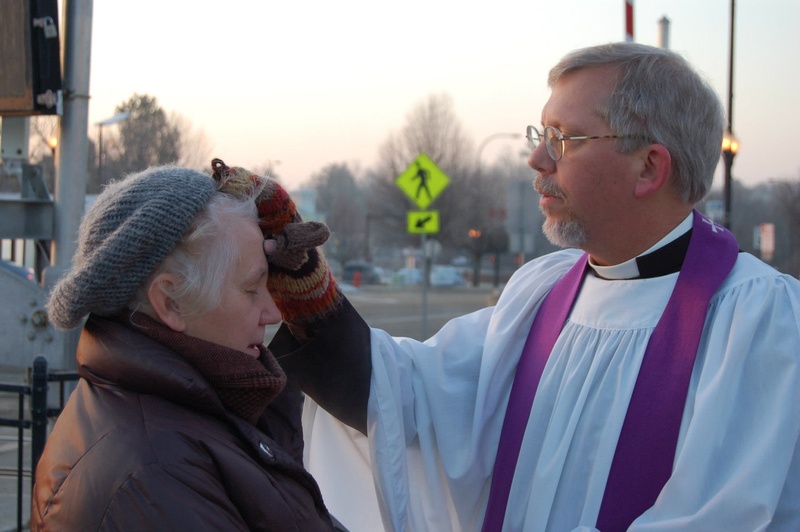 The Milwaukee Journal-Sentinal covered this ecumenical outreach. From DeKalb, IL Stacy Walker-Frontjes reports: This year we had more people from St. Paul’s, DeKalb involved in offering Ashes on the Go, and we reached twice as many students walking to and from classes at Northern Illinois University across our property. 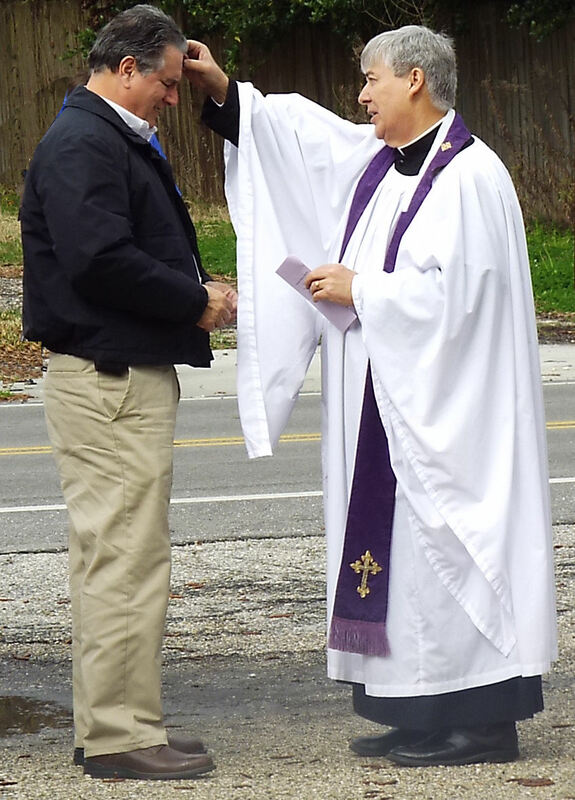 We had publicized the event the week before in the local papers, and we had people drive, walk, and bike to our site specifically to receive the imposition of ashes and find out more about the Episcopal Church. It was a great day for all the baptized at St. Paul’s, as well as their priest. 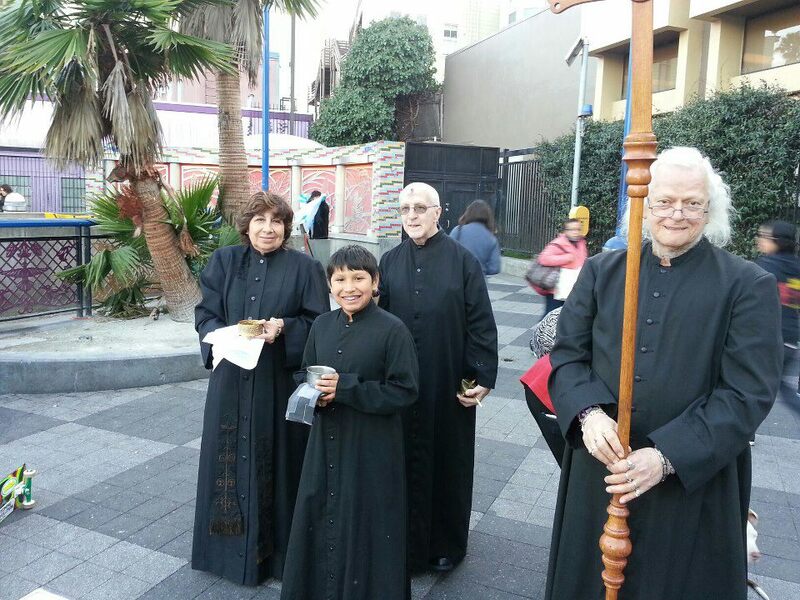 From San Francisco, CA, Tommy Dillon writes: The Diamond Heights Shopping Center next door to St Aidan’s said were not able to give ashes only but said we could raise awareness and money for our food pantry. 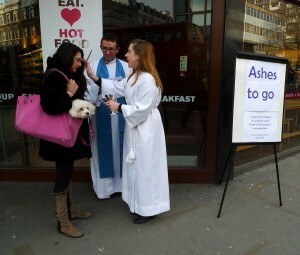 So we set up a table to do that as well as offer ashes. Over 25 people came forward while shopping. Many sharing tears since the church came to them. And from Glen Ellyn, IL, Matt Gunter engages the conversation about whether to do Ashes to Go as he shares his experience. From Sterling, IL, David Rude writes: Theoretically, offering ashes beyond the context of the liturgy sounds like a grilled cheese sandwich without the bread. But travel the highways and byways of life imposing ashes then what is merely a symbol in the liturgy becomes a sacrament beyond our hallowed walls. What an amazing phenomenon. 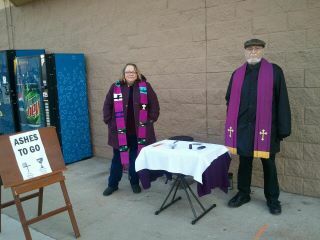 Grace Episcopal Church and Rock Falls Christian joined forces at Wal-Mart to bless the community. From Little Rock, AR, Lisa Hlass writes: It was absolutely amazing! Talking about people from all walks of life hungry for good news! 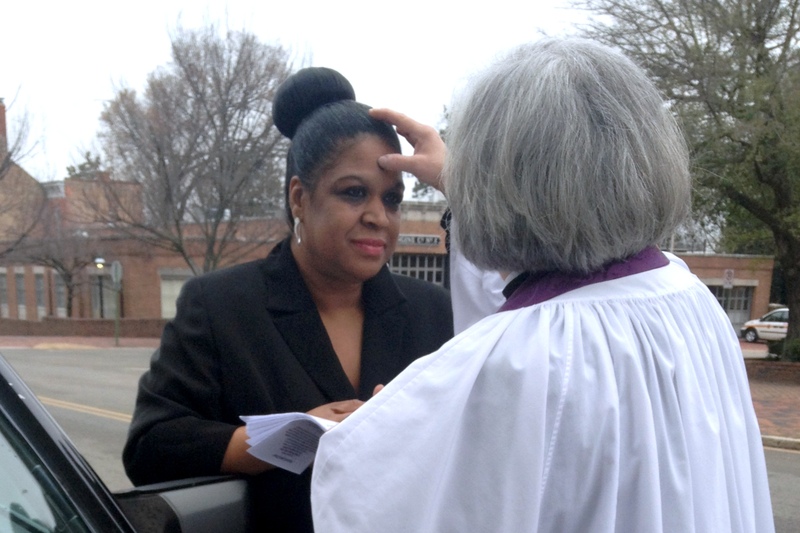 Thanks to the long line of committed priests, including Teresa Danieley (St. Louis), Emily Mellott (Chicago), and Mary Vano (Little Rock), “Ashes to Go” (or “Ash Wed. on the Go”) has come to St. Michael’s, Little Rock, and the Episcopal Diocese of Arkansas. 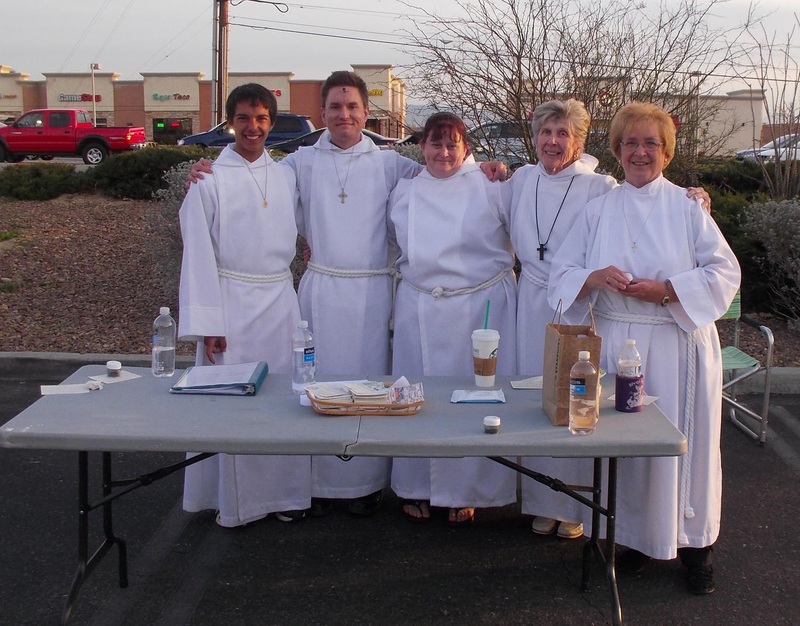 We (lay and ordained folk from St. Michael’s Church and San Damiano Ecumenical Catholic Church) set up in a nearby shopping center. 62 people from all walks of life, mostly Episcopalian, Roman Catholic, Methodist, and presently unchurch, came to receive ashes and a prayer. They were spiritually hungry and grateful, all of them. Some of them took a Lenten devotional booklet, others chose not to. They were young, middle-aged, and old; black, white and brown; evangelical to orthodox (if we must use those labels). Every person that “gave” or “received” was blessed to overflowing. The word spread through signs and people driving by who saw us; but mostly through facebook and emails. That’s how Grover, from Channel 4, heard about it. Grover got his story, but not before he got ashes and a prayer (for which he was deeply grateful). 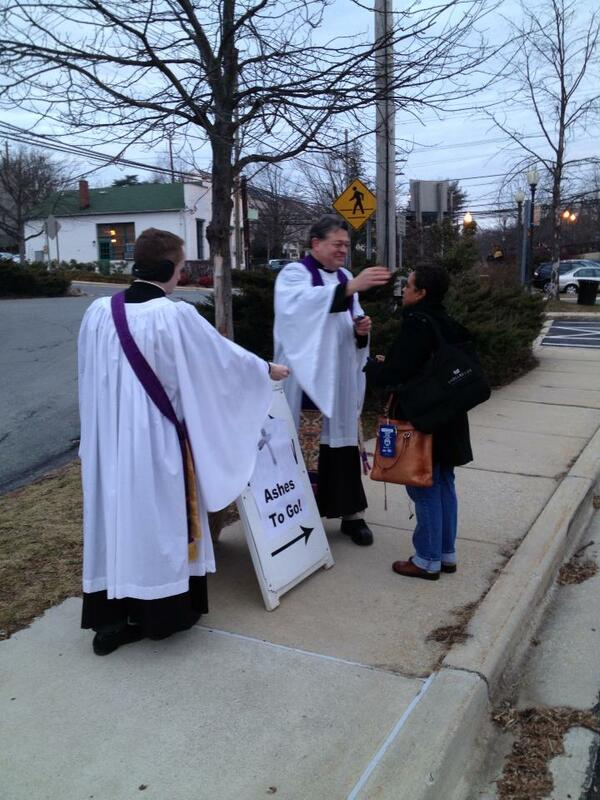 Some of the people who came were not going to be able to get to their church’s Ash Wed. liturgy. Others had no intentions of going to church, but loved getting ashes to go. Still others had not been to church in years, but are certainly thinking seriously about it now. I’m still reeling from the Spirit’s powerful movement that day; so much so that I’m having a difficult time quietening for Lent. Oh well, that’s how it is in the Kingdom of God, huh?! Thanks be to God! From St Louis, MO: A gallery of pictures from ecumenical Ashes to Go in the Tower Grove neighborhood and Ashes at the Office in downtown St Louis. Where were you for Ashes to Go? 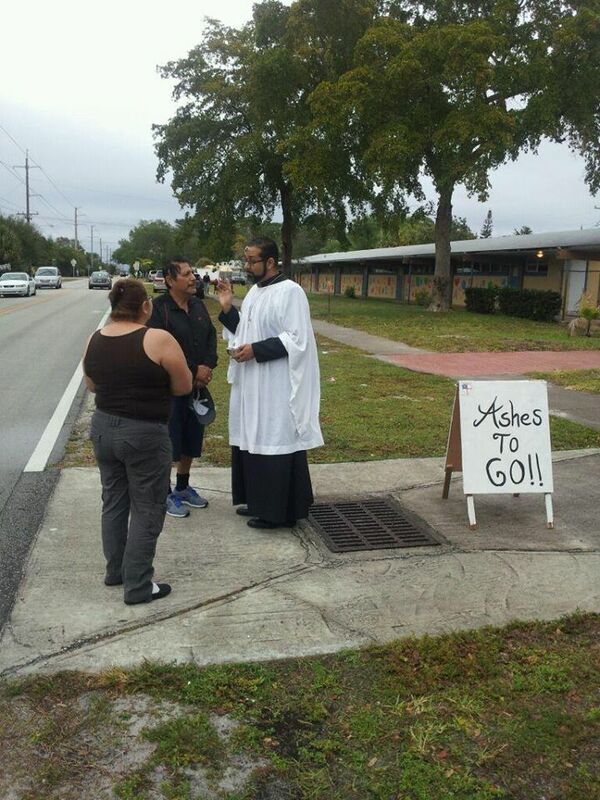 I went with ashes and armed with a sign that said “Get Your Ash Here!” and was able to serve ten people with ashes. I was able to have conversations with many other people. 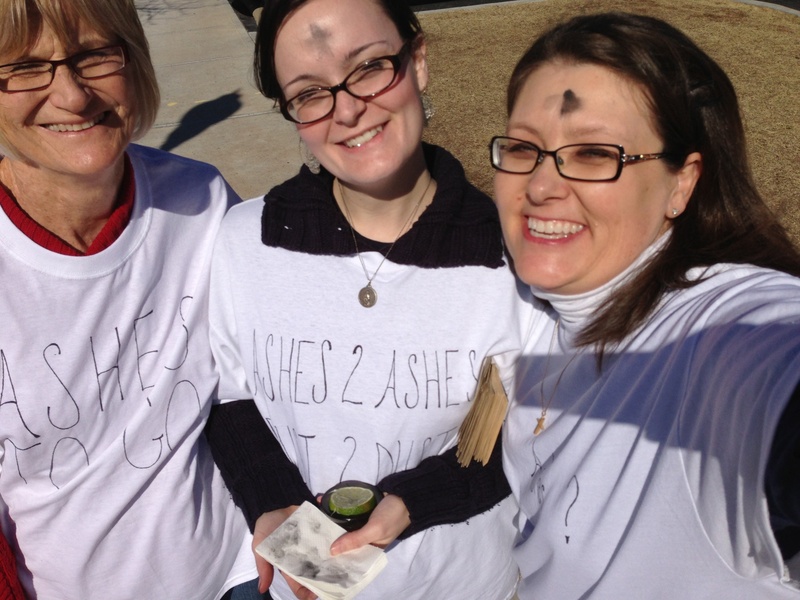 One man said, “I do not want the ashes but what is Ash Weds?” we were able to have a great conversation about it! Another lady wanted prayer because her house was forclosing and I was able to give her information to get her in touch with people that can help her out. This was such a blessing to me! But I got there at 4:45am and stayed until 7:15am – and it was freezing cold…However I would do it all again in a second!